Members of an organized criminal group led by a deputy head of the Opposition Bloc faction in Mykolaiv City Council have been caught red-handed, Ukrainian Prosecutor General Yuriy Lutsenko has said. "Tonight in Mykolaiv, members of a criminal organization, headed by deputy head of the Opposition Bloc faction in Mykolaiv City Council I. M. Kopiyka, with the participation of his son, M. I. Kopiyka, an assistant, two heads of enterprises under his control in the sphere of housing and utility services, were caught red-handed," he wrote on his Facebook page late on Monday, January 15. Lutsenko specified that the detainees had systematically embezzled budget funds during 2016-2017. "In December 2017, members of the organized crime group, trying to hide their criminal activities, were convicted of transferring a bribe of 250,000 hryvnias to an employee of the prosecutor's office, who informed his leadership about it in advance," he wrote. 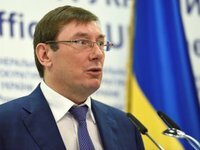 Lutsenko added that five members of the criminal group had been detained.